Palo Alto, California-based Hewlett Packard Enterprise (HPE) is scheduled to post its fourth-quarter earnings after market on Dec 4. The Street expects earnings of about $0.43 per share on revenue of $7.85 billion. The IT services giant improved 9.09% from its recent low of $13.75. Trading in the $15 range, it is well off of its target price of $18.42. On Aug. 17, President and CEO Neri Antonio F sold about 36,500 shares for $16.5 per stock. These factors could make HPE quite an unfavorable stock if it misses estimates on Tuesday. 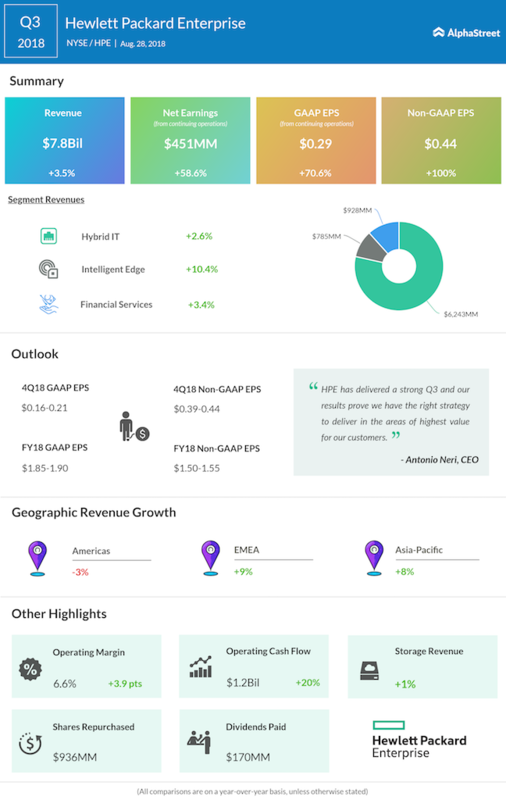 In the previously reported quarter, Hewlett Packard Enterprise posted upbeat earnings for the third quarter on higher demand in the non-US markets. The stock gained in the after-market trading following the announcement back in August. The fact that the stock hit its all-time high back in March could also be a silver lining, and this could act as a driver for investors giving the stock another chance. In last week’s HPE’s Discover conference in Madrid, CEO Neri Antonio also said that the trade war has very little effect on the company. This could also help the stock to be perceived as positive, especially in the current international trade scenario. The company also upgraded up its full-year earnings guidance in August on upbeat quarterly results. HPE now expects earnings of $1.85-$1.90 per share, and raised the outlook for adjusted earnings to $1.50-$1.55 per share for the year. For the fourth quarter, the California-based company forecasts earnings of $0.16 -$0.21 per share and adjusted earnings of $0.39-$0.44 per share. Back in 2015, Hewlett Packard Company had split into HP Inc. and Hewlett Packard Enterprise.